The chart of FuturoCoin (FTO) proves that this crypto should be considered as one among many to invest in. The upcoming months of the year 2018 might be a special time for cryptocurrency traders. Basing on last year’s situation, everyone is wondering if the cryptocurrency market will reach its highest once again. What crypto should be in your wallet? Among all of the cryptocurrencies, there are only few projects that are worth investing in. What’s even harder to decide, is to find a project that is good not only to take a short position, but also for a long one. 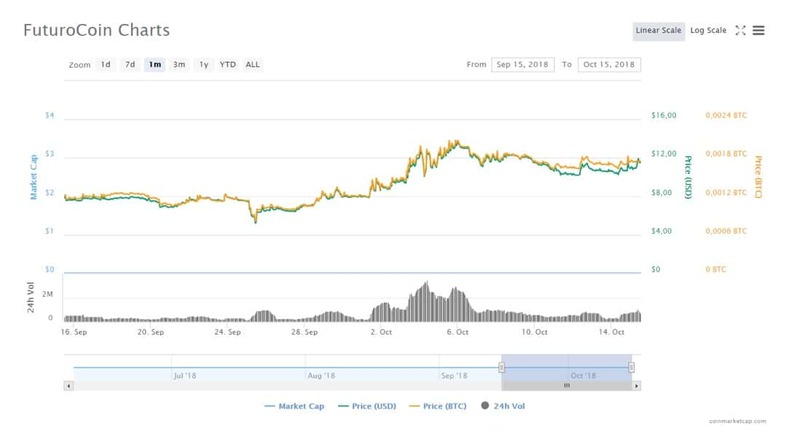 The chart of FuturoCoin (FTO) proves that this crypto should be considered as one among many to invest in. After a few months from the launch of FuturoCoin, this cryptocurrency got listed on more than 6 comparison services like Ffeixiaohao or, the most popular, CoinMarketCap which may indicate the increasing interest in FTO. Another sign of the high interest is the event that took place in July when this cryptocurrency broke the record barrier of $3,000,000 daily volume. What’s more, FuturoCoin hash rate is the second biggest hashing power on the X11 algorithm, right behind Dash. Lately, this cryptocurrency has been listed on 8th cryptocurrency exchange platform – Cryptostock by DARB. That’s a newly created platform, so adding FTO with other “basic” cryptos is a huge honour and a success. Where else can you find FuturoCoin? On CoinDeal.com, BitBay.net, Coinbe.net, southxchange.com, Exchange.me, Piyasa.net and Yobit.net. The list is getting longer every month as the community of FTO’s getting bigger. In the time when there is over a thousand of different cryptocurrencies, the project developers have to remember about the main assumption of the digital assets; help crypto-owners avoid third-party companies and provide real usage of crypto in daily life. FuturoCoin didn’t forget about it. For example, you can pay with FTO in FN cafés and buy this crypto in ATM in Aurelio Restaurant. FuturoCoin has been added to Paycoiner – a cryptocurrency payment gateway; that move allows a wider implementation of it. Thanks to that, FTO can be implemented in online shops. What’s more, if you like to gamble you can try it in FuturoDice – a gambling website where the fate decides about your profit. If you look for an entertainment, download the Coin OFF Mine game and look for FTO coins around the world. Everything mentioned above only proves that FuturoCoin is not only fast developing cryptocurrency, but also a well-supported project. The timeline shows that the crypto is going to be even more widely known because of the other projects and the team of developers which take care of the FTO society.